Increasingly generous travel rewards credit card offers have made it easier to earn points and airline miles. But at the same time, it’s become even more challenging to find award seats at the lowest mileage levels. Today, I want to examine a unique feature of United’s MileagePlus credit cards that allow you to unlock hidden Saver and Everyday awards, so that you can find the flights you need for your next trip. I find that United tends to offer more Saver award space — award seats at the lowest mileage levels — than most other frequent flyer programs. But that’s not saying much these days, when most airlines give out plenty of miles to travelers and those who use cobranded airline credit cards, but offer vanishingly few seats at the lowest mileage levels. And United is often no different. Thankfully, United’s MileagePlus program has three things going for it. First, it has one of the best online award search engines, along with its redesigned mobile app. United generally shows every partner’s award space, but not always. Secondly, it’s one of the only frequent flyer programs that never imposes fuel surcharges on awards, allowing you to book award seats on any partner carrier and only pay government-imposed taxes and fees. United’s website hints at the benefits of having a MileagePlus card. The United Explorer Card, the United Explorer Business Card and the United MileagePlus Club Card (as well as its business version) offer the ability to “use miles for any seat, any time, on any United flight” at the Everyday award level — higher than the Saver level, but the perk here is that you can use miles on any flight with availability. United also offers all MileagePlus card holders better award availability for United awards in economy, including both Saver and Everyday awards. This is the same benefit it offers to its MileagePlus members with elite status, and it’s the primary reason why I’ll always have an active MileagePlus credit card account. This is a search for six seats from Denver to Liberia, Costa Rica, which are available at the Saver level but only to United MileagePlus cardholders. Chase highlights expanded standard (“Everyday”) award availability as a card holder benefit, but it’s silent on the increased Saver award availability that card holders can expect. However, United’s website makes sure to let you know. Let’s look for six award seats from Denver to Washington Dulles. Without logging in, the seats are 20,000 miles each. But once I log in as a United MileagePlus card holder, I see the same flights, but at the Saver level of 12,500 miles. United’s website is unique in that it offers an “Expert Mode” where you can reveal the fare classes offered. To enable Expert Mode, change your Search Preferences and check the corresponding box. Once you’re logged in and have Expert Mode enabled, you can then reveal the fare codes, but only when searching for revenue fares (not awards). The X fare class is the economy-class Saver award space open to everyone, while the XN fare class is only accessible to United credit card holders and United elites. You can see that UA1949 departing Denver at 6:35 am and UA919 departing Denver at 8:15 am both have at least 9 Saver award seats in the XN fare class offered to United credit card holders and elites, but zero seats in the X fare class offered to everyone else! You can imagine how critical this feature can be, especially for family travelers. If you have a United MileagePlus credit card, always be sure to log in to your MileagePlus account when searching for award space, otherwise it won’t return results in the XN class, reserved for card holders and those with elite status. Since this expanded Saver award availability only applies to economy-class awards, it might appear to be of limited interest for those looking for business-class or domestic first-class award space. However, United offers a waitlist for a Saver awards in business class so long as there is also a Saver award availability in economy. It turns out that a little-known clause in United’s Award Travel Rules says that you can call to book a coach award at the business Saver level, and then be wait-listed for a business-class seat. Once on the waitlist, you should be upgraded to a business-class (or domestic-first) seat if it becomes available as a Saver award. But even if it doesn’t, you’ll be at the top of the upgrade list at the airport, ahead of everyone else using miles to upgrade, or those being upgraded due to their status. Technically, you aren’t even being upgraded, since you’ve already redeemed the miles needed for the higher fare class. 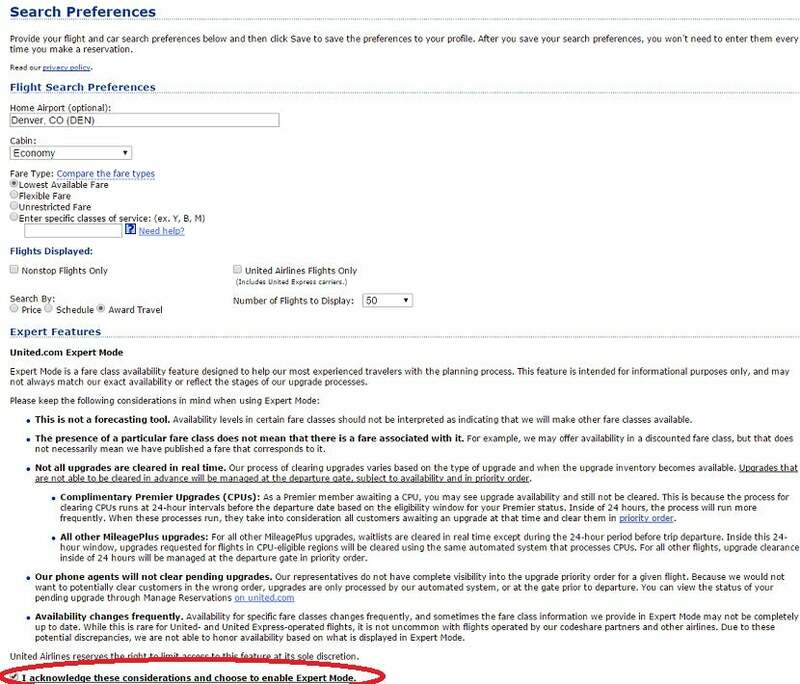 United’s rules for wait-listing flights in a higher class of service. Your upgrade priority will only be behind those who paid for business-class upgrades and those who booked business class using the standard (non-Saver) awards, so your chances of being cleared into the next class of service will have improved greatly. Plus, the additional mileage required to fly in business class will be refunded if you eventually end up flying in coach. Which United credit cards offer expanded award availability? Furthermore, there’s a no-fee version called the MileagePlus Card, which is only available through a product-change request. You still retain the benefit of additional Saver and Everyday award space even when you hold the no-fee MileagePlus Card. Beyond the increased award availability, the United Explorer Card has several other valuable features. The current sign-up bonus up to 60,000 bonus miles (Earn 40,000 Bonus Miles after you spend $2,000 on purchases in the first 3 months your account is open. Plus, earn an additional 20,000 Bonus Miles after you spend $8,000 total on purchases in the first 6 months after your account is open). The United Explorer Business Card currently offers new applicants 50,000 miles after spending $3,000 within the three months of account opening. Card holders receive the first bag checked for free for themselves and a single companion — just note that you have to use your card to pay for the tickets or award taxes to get the free bag. Other benefits include a $100 application fee credit for Global Entry or TSA PreCheck, priority boarding and two United Club passes each year. Both versions of the Explorer card have a $95 annual fee that’s waived for the first year, and no foreign transaction fees. If you want United Club access, you could also consider the United MileagePlus Club Card, which offers full membership to United’s airport lounges and two free checked bags for you and a companion. The card’s currently offering a sign-up bonus of 50,000 miles after you spend $3,000 in the first 3 months. It has a $450 annual fee and no foreign transaction fees. Considering the increased Saver and Everyday award availability and the ability to be wait-listed into Saver business class, United’s cobranded credit cards can be an essential tool for making the most of your miles.